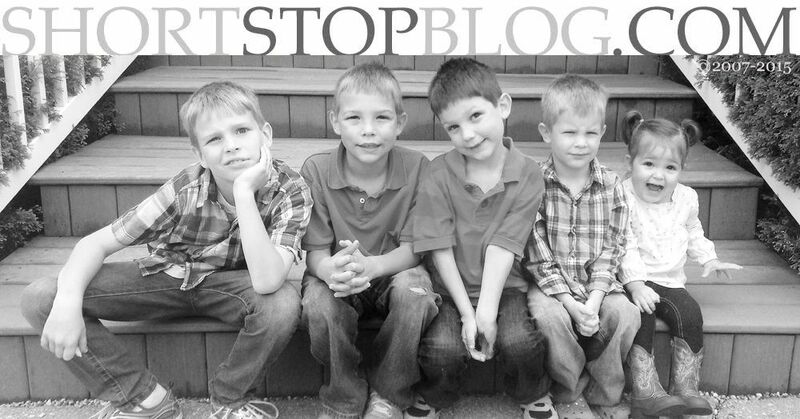 One of the most popular recipes on this blog is Mom's Chocolate Chip Cookies. I know, I know - everyone has a good chocolate chip cookie recipe. But, Mom's are the best. They just are. Once I introduced them to you all, many of you now make them as your standard chocolate chip cookie recipe. My friend, Leigh Ann, emailed me last week and asked me if I'd ever made them in a bar form before. I hadn't, but when she tried it and told me they turned out perfectly, I couldn't wait to try them myself. 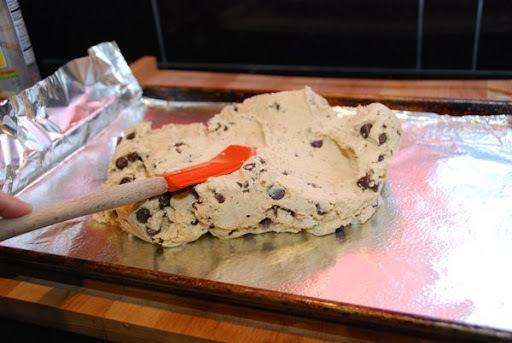 Some days, I just don't have time to scoop out and bake dozens of cookies. So, bar cookies are the perfect answer for that. And, since bar cookies are so incredibly easy to make, I just took pictures of what I do when I make bar cookies that makes my life so much easier. Since making life easier is the point of making bar cookies in the first place. 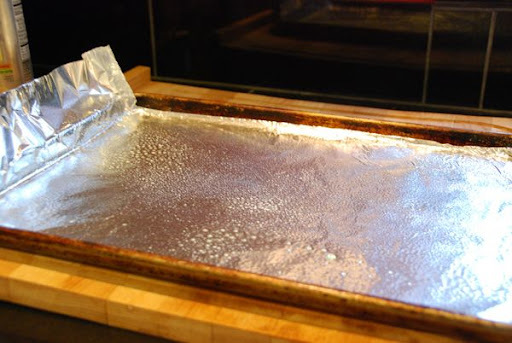 First, line a 15" x 8" jelly roll pan with foil, and spray it with cooking spray. (My jelly roll pan has been loved, can you tell?) Make sure you leave about 3 inches of foil sticking up on each of the shortest ends. You'll see why in a minute. 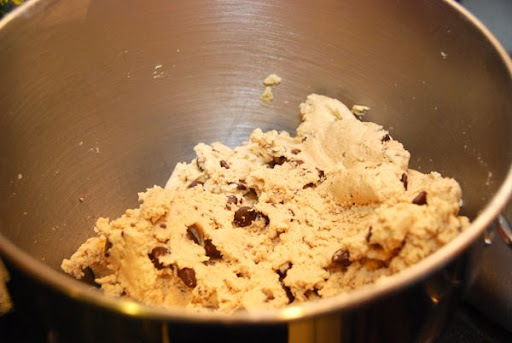 Whip up a 1/2 batch of Mom's Chocolate Chip Cookie Dough. (recipe below for 1/2 batch) You could make a full batch, and freeze the second half for cookies if you want! 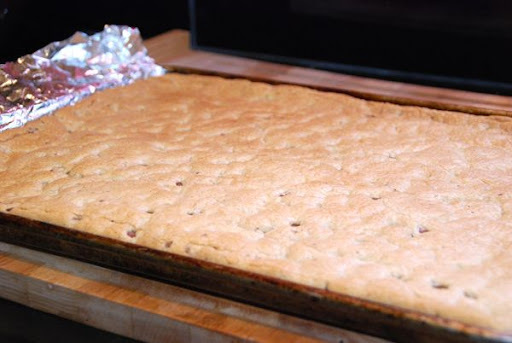 Dump the dough onto the jelly roll pan, and using a spatula or wooden spoon, spread the dough evenly into the pan. 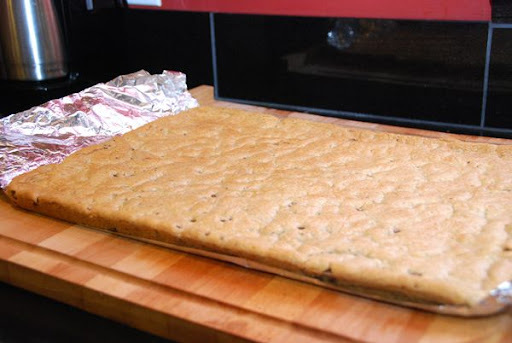 Bake at 375 degrees for 15 minutes, and out comes a pan of golden brown chocolate chip cookie bars. Here's where that extra foil comes in handy. 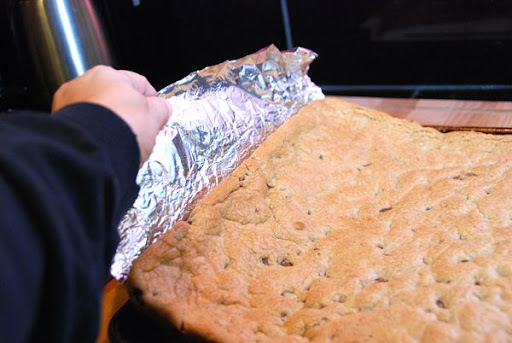 Lift the bars out of the pan by the foil on each end. (Easiest cleanup ever!) The bars will bend and move as you need them to (as you can see), and won't break. I love how forgiving this dough is. You won't have to do this with a camera in one hand - it's much easier that way. I immediately cut off the corner piece and ate it. I made them. That's my prerogative. Plus, I'm the Momma. I have rights. See how easy it is to slice them since they're not in the pan. I slice them into long bars, not square. They're easier to hold and eat that way. And, that's how my mother-in-law always makes her bars. I love them this way. They're so good. Soft, a bit chewy, golden on the outside. Different than cookies, but just as good. And, this large pan of bars was ready, from start to finish, in 25 minutes! 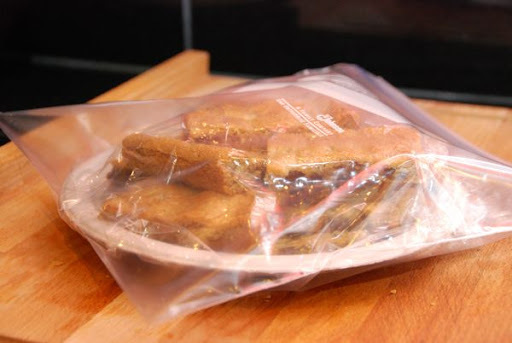 Since this makes a whole lotta bars, you can place half of them on a paper plate, cover them in plastic wrap, and slip them into a gallon sized bag. Then, freeze. When you need a dessert to take to a party or get-together, just pull them out of the freezer and go! 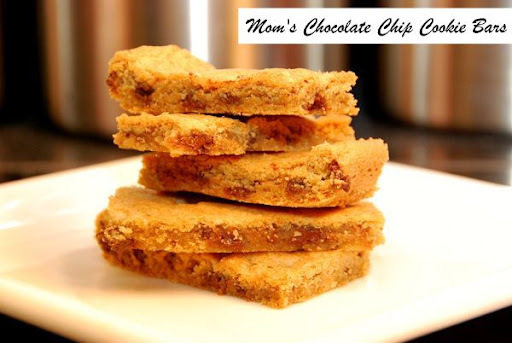 Mom's Chocolate Chip Cookie Bars. Easy, quick, makes a ton. And, SO good. Preheat oven to 375 degrees. Line a jelly roll pan with foil, leaving three inches on each of the ends. Spray with cooking spray. Set aside. Cream butter and shortening and two sugars together. Add eggs and vanilla. Beat until combined. Add flour, 1 cup at a time. Add baking soda and salt with last cup. Stir in chocolate chips. 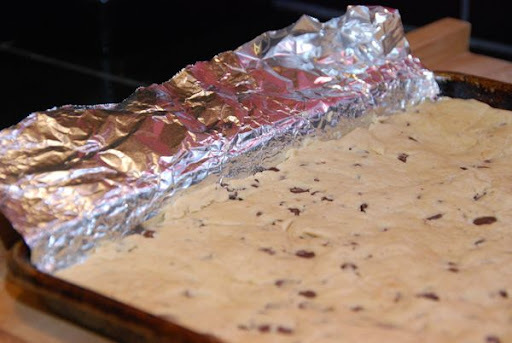 Spread dough onto jelly roll pan. Bake at 375 degrees for 15 minutes. Remove from oven. Cool slightly. 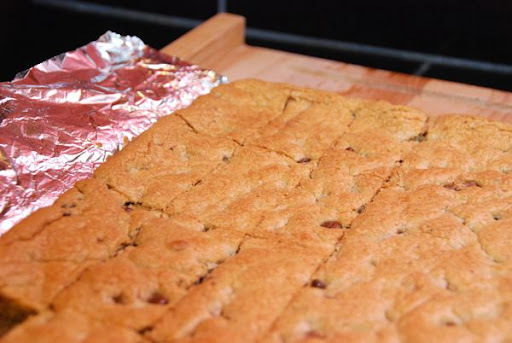 Pulling by foil on each of the ends, remove the bars from the jelly roll pan and set on cutting board. Slice bars into rectangles. Serve. Love the extra easy tips you included, especially freezing a plate for when you need to bring a dessert somewhere... that is sheer genius! I've made them before, but I love your idea about the foil and freezing some. This is a comment completely unrelated to your recipe but Sarah, I wanted to let you know how your story on Servanthood has impacted my thoughts many, many times since reading it. Thank you for sharing that and I'll be reading what you wrote to my Bible Study group tonight. It's one of those that I'll always remember because it has helped me and I know it has helped others too. This is great! 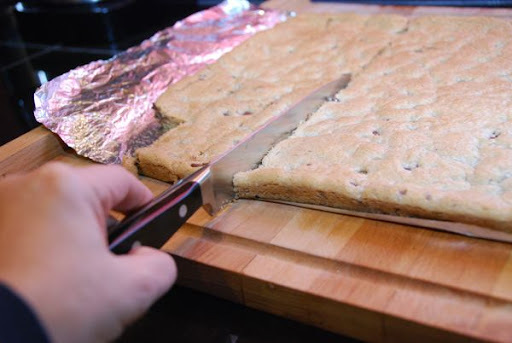 I cut my bars with a pizza cutter for easy cutting. this chocolate chip cookie recipe is AMAZING. i made them this weekend, and everyone who has tried them is in love. i'll never use another recipe! although, i was worried at first that my poor kitchen aid couldn't handle the double batch recipe. thankfully, it rose to the occasion. i love the idea of making them into bars...we'll have to try that next time. Thanks for the great recipe! I was having trouble spreading it thin enough to use only half the dough, so I just used the entire batch to make thicker bars. I reduced the temperature to 300 degrees and baked for 30 minutes. They just came out of the oven and they look great. Thanks for the great recipe and idea for making the bars, because it was just what I needed for tonight's meeting! Made these tonight. Might have found another way to my hubby's heart. YUM!! !